PBC 734 was new to Leicester City Council in 1956. It is a Karrier Q25 with Readings C14F body. If the note in the PSVC listing for 2012 is correct, it did not join the Transport Department, so was it some form of welfare vehicle or school bus? It’s 15 July 2001, a soggy day in Lord Street, Fleetwood, where it is visiting the Tram Sunday event. 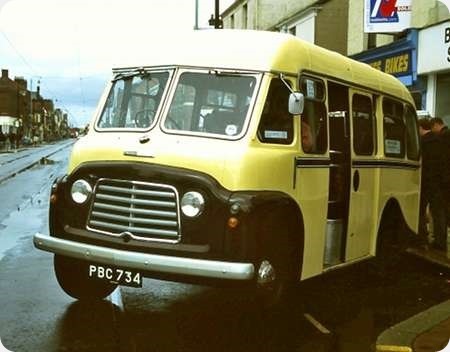 We all know what people mean when they describe a certain generation of minibuses from a certain manufacturer as ‘bread vans’, but this looks like an ice cream van to me. Mind you, not bad looking for a tiddler. Not sure what Leicester City Council originally used it for but the Coventry Museum acquired it in 1980 as a donation from the Leicester & County Mission for the Deaf. It was restored in its original livery by the Museum workshops in 1988. Courtesy of Newcastle City libraries archives. The two vehicles in the photo are 20, a Karrier, and an AEC; it is a bit blurred, but possibly 13 or 15. 10/19 were AEC, with English Electric running gear. 20/29 Karrier, with Metropolitan Vickers Company Ltd running gear. 30/39 GUY, with British Thompson Houston running gear. On the face of it, all the bodies appear to be the same. They were H33/27R, had two sets of stairs, doors at the front and an open platform at the rear. However, three different Coachbuilders were used. and 20/39 were – Metropolitan Cammell Carriage + Waggon. I believe Bournemouth had similar vehicles. As far as I am aware, Newcastle was the largest network outside London. At its peak, the post war fleet numbered in excess of 200 vehicles, just over half of which were three-axle type. The largest number of one type were 70 BUT 9641’s with English Electric running gear, and H40/30R MCCW bodies, the first batch of 20, LTN 479/98, 479/98; were delivered in 1948/9, and were identical to the London Q1 type, even down to the LT style destination layout. Also in 1948/9, they took delivery of 30 Sunbeam S7’s LTN 499/528. 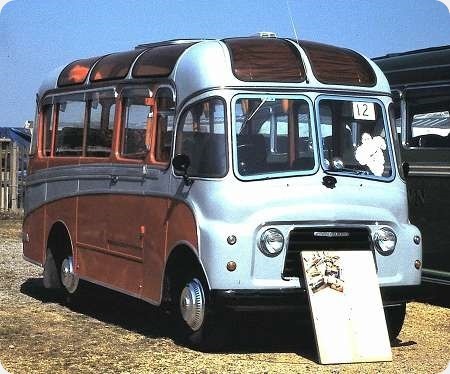 499/528; they had Metropolitan Vickers running gear, and H39/31R Northern Coachbuilders bodies: The remaining 50 BUT’s, NBB 579/628, 579/628; were delivered in 1950, although very similar to the first 20, they had the standard Newcastle Corporation destination layout. Two vehicles have survived into preservation, 628 is from the 1950 BUT batch, and is located at the East Anglia Transport Museum, appropriately it was the last trolleybus to enter service, and 501, a 1948/9 Sunbeam S7, has been restored by Beamish Museum. They were reunited in 2011, for a special event at the East Anglia Transport Museum, photos of which can be found on their website. None of the two axle versions survives. A lovely posed photo of the initial Newcastle trolleybus fleet. 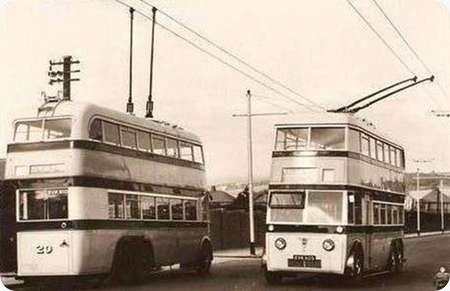 I have a book published by Newcastle City Libraries 1985 which describes the two trolleybuses in the photo as No. 15, an AEC 664T with Brush body and No. 20, a Karrier E6A with Metro-Cammell body and the year is 1935 and the location is Denton Bank.